How do we enter the building? What happens in worship? What is worship like? If you have questions that are not answered, please give us a call (563.382.3247) and we will be more than happy to help! Weekly worship at Washington Prairie happens on Sunday mornings at 10:00am. There are times in the year when we gather at other times and days of the week. Please see our 'upcoming events and calendar, or contact us for more information on special worship opportunities. What door shall we use to enter the church building? There are three doors with which you can enter the building. Any of the three will work! We do, however, suggest that the easiest entrance is located on the south side of the building. This door is handicap accessible and is also the door closest to the entrance into the sanctuary. What happens after we enter? You will be greeted by our ushers who will be very happy to welcome you and direct you into the sanctuary (where we worship). You will be given a bulletin, which will guide you through worship. The bulletin also contains any announcements regarding the life and happenings of Washington Prairie. The ushers will also answer any questions you might have. If you have small children, please know that your children are welcome in worship!! We have 'busy bags' available (filled with quiet toys, coloring books, etc.) for those who are 'busy.' If you would like, in the course of worship, to step outside of the sanctuary with your child, the door on the front right side of the sanctuary leads out into our parish hall, kitchen and restrooms. You will be able to hear what is going on in worship in the parish hall. There is a pattern; a rhythm to how we worship. The bulletin will help guide you. Also, we use the worship resource called Evangelical Lutheran Worship, which is a red hymnal located on the back of the pew in front of you. Located in the same place, are bibles as well. Gathering: We come together in the name of Jesus Christ to worship. During the gathering part of worship we will welcome each other, share announcements. After that, we will either share a time of thanksgiving for the gift of baptism; when we give thanks for being cleansed, forgiven and named children of God, joined with each other, and joined with Jesus in his death and resurrection or, we come before God confessing our sins and hearing that we are forgiven. After that, we will sing a song and/or share in a combination of prayer and song. After the song, we pray a special prayer that fits with the particular Sunday. On some Sundays, this might be followed by some special music shared by members of Washington Prairie. Word: The next part of the worship involves hearing God's word. We will share some reading from the bible; usually a reading from the Old Testament, a Psalm, a reading from the New Testament that is not from one of the gospels (Matthew, Mark, Luke, and John), and then a gospel reading from one of the Gospels. This is followed by a message for the children who are at worship (all our welcome! ), and then by a message from the pastor or other guest preacher. This message, or sermon, is based on the readings of the day, and help show all of us the importance and relevance for our lives here and now; how Christ's love and mercy covers all of us! Following the message, we will sing another song and then say together a common statement of faith, such as the Apostles' Creed (printed either in the bulletin or in the ELW). Thanksgiving: This part of worship begins with the sharing of the peace. The pastor says, "The peace of the Lord be with you." The congregation responds, "And also with you." We then, take time to greet one another with a word of peace. Next we collect an offering. If you are visiting, please know that it is not expected for you to make an offering. The money and gifts we offer back to a good and gracious God are used for the mission of God's church. On the first and third Sundays of the month, and on special festival days, worship continues with communion (also known as The Lord's Supper or the Eucharist - from the Greek for thanksgiving). Here we celebrate in a way that Jesus taught us, understanding that God is present in the bread and wine. These are tangible ways we can experience God's love and grace. If you are a baptized Christian and have had communion elsewhere, you are welcome to come forward. Children are always welcome to come with their family for a blessing. If you would rather not receive communion; that is ok: Christ is with us always. But please know, all are welcome at the Lord's Table! 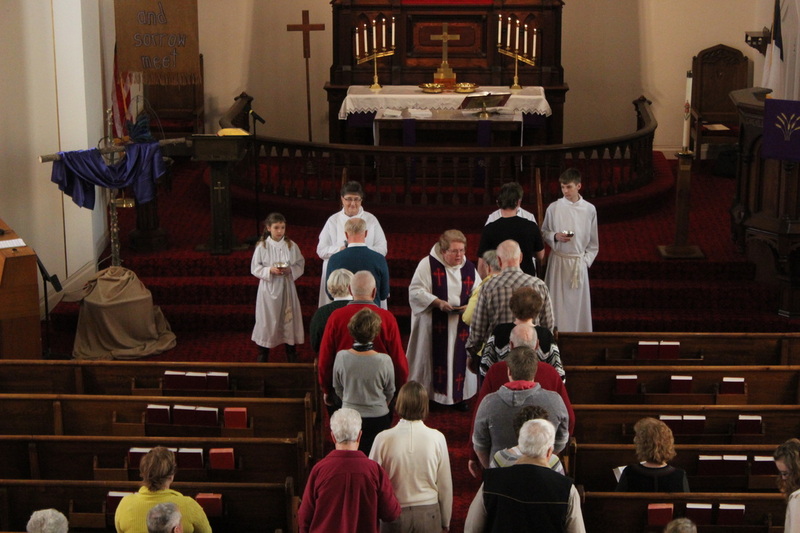 Sending: Worship concludes with a blessing, another song is sung, and we are sent out. The pastor calls us to "Go in peace, serve the Lord!" The congregation responds, "Thanks be to God!" And we are sent out, to share the good news of Jesus, and to serve God's people, and to live in the promise of everlasting life! While our worship is flexible, using the gifts and talents of God's people at Washington Prairie, and the music we sing covers a variety of styles, this overview of worship is close to what you will experience when you worship with us. We hope that this has been helpful to you. We look forward to welcoming you!